Google’s chief economist interview on The McKinsey Quarterly. How can you know when someone is bluffing? Paying attention? Genuinely interested? The answer, writes Sandy Pentland in Honest Signals, is that subtle patterns in how we interact with other people reveal our attitudes toward them. Professor Alex (“Sandy”) Pentland, is a leading figure at the MIT Media Lab and is a pioneer in the fields of organizational engineering, mobile information systems, and computational social science. Harvard Business Review reports the breakthrough Ideas for 2009, it is worth to check. Making money out of social networking sites is not that easy,in fact a year later, AOL Is contemplating a Bebo sale. All the major social networking sites are struggling in finding a viable business model. But who uses these websites?A Facebook Pages Tracker helps us understand something about the phenomenon. I wrote about ted.com in the past in this blog (How creativity is being strangled by the law and Inspired talks by the world’s greatest thinkers and doers ) and I have been reminded of this great website by a NYT article Confessions of a TED Addict. Closing the Innovation Gap: Reigniting the Spark of Creativity in a Global Economy . John Battelle reports that Google Lays Off Real Googlers. In fact, 100 people will be laid off from the HR (From Google Blog: Changes to recruiting). Then some of the small engineering sites will be closed to have more concentrated development sites (From Google Blog: Changes to engineering). Then, some products will be discountinued, from the Search Engine Land Blog Google Ends Google Video Uploads, Shutters Notebook, Catalog Search, Dodgeball & Jaiku. All of this makes perfectly sense, especially in the particular moment we are in. Motorola for example has announced other 4000 workers in addition to the 3000 laid off last October (NYT: Motorola Plans 4,000 More Job Cuts in 2009). Motorola has slashed 50% of its workforce in the mobile phone division and now focuses on the Google Android platorm. As Battelle has written, when Google catches a cold, it’s a sure bet a lot of other companies have pneumonia, or worse. However, as in all the economic cycles, there are downturns followed by upturns and the situation will get better. Today the Financial Times reports that China overtakes Germany as world’s third economy. The first is USA, the second Japan. There are two methods of GDP calculation: nominal GDP attempts to compare countries using current exchange rates to give an assessment of their clout within the global market. Purchasing Power Parity or PPP GDP, on the other hand, tries to take into account that one dollar can buy more in some countries and less in others. In the nominal GDP method, we can see that the developed world leads the pack, but that China has already broken into this exclusive club. When we look at PPP GDP, Brasil, Russia, India (BRIC) are all within the top 10. Economic output is spatially concentrated by any measure and across geographic scales. A quarter of the world’s GDP is produced on just 0.3 percent of the land area (about the size of Cameroon), half on 1.5 percent, and nine-tenths on 16 percent. China, Japan, and the United States produced about half of global GDP in 2006, and the 15 largest economies produced about 80 percent. 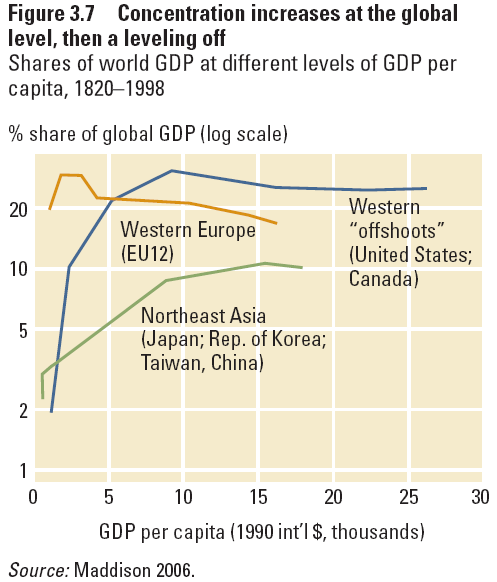 Early in the Industrial Revolution, at the beginning of the nineteenth century, GDP per capita in today’s industrialized countries was about twice that of today’s developing and emerging countries (see table below). But total GDP in China and India, which had far larger populations, was more than twice that in today’s G7 countries. By the middle of the twentieth century, the G7 countries accounted for more than half of global output (about 60 percent if the other western industrial countries are included). North America and Japan grew the fastest at 3.5 and 2.8 percent a year between 1820 and 1998.40 The four largest European economies grew at an annual average of about 2 percent, not very different from growth rates in Africa, Eastern Europe, and the smaller Asian developing countries. But while GDP growth exceeded population growth by 1.7 points in the G7, it did so by only 0.8 points in China and India and by 0.7 points in Africa. Over the 180 years to the end of the twentieth century, these different growth rates moved the concentration of economic production more toward the northern industrialized countries. How did this concentration come about? The concentration of economic mass in today’s western industrialized countries and Japan has its roots in eighteenth-century economic and technological innovation.